Born on 15th April 1858 in St.Kilda, Victoria, Australia and educated at Hereford Cathedral School. He was the son of James Bevan and Elizabeth Fly. 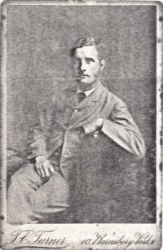 He played for Clifton in the 1878-1879 season. On October 10th 1877 he went to St. Johns College, Cambridge University where he gained 2 blues in 1877 and 1880. He completed his BA in 1881 and his MA in 1891. He became captain of the first Wales XV but after a disastrous match was never selected again. He went on to become an Anglican Clergyman.